I got an new iPhone this week. It's inspired me to make a few changes to the Daily Cocktail. 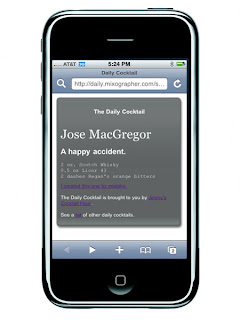 So while the rest of you are off having fun at Tales of the Cocktail, I've been working to make the Daily Cocktail iPhone friendly. for a new cocktail each day. Each cocktail has a recipe, links to source information or blog entries related to the day's cocktail. There's also a link from each daily cocktail where you can see previous day's cocktails. 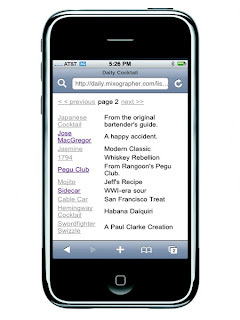 The Pegu Blog also has a list of cocktail sites that work with the iPhone. If you're looking for a more fully featured cocktail application, check out the cocktaildb's Cocktail App at the Apple App Store. I'd also like to ask you to take my reader survey if you haven't done so yet. It only takes a minute and all the survey information is anonymous. I heard a little bit about bacon and fat-washing from Jim Meehan while I was at the Grand Marnier Mixology Summit. I read a little bit about it on the internet. I wasn't really a believer in the power of bacon whiskey until I asked my buddy Lance about it. See, Lance is a bit of a mad scientist, and a founding member of the Oregon Bartenders Guild. Those guys have a lot of great ideas and Lance has ALL kinds of experiments going on in his secret laboratory. If Lance says bacon whiskey is good, bacon whiskey is good. I'm a believer. I followed Lance's instructions and made myself some bacon-infused whiskey. Build over ice in a rocks glass, garnish with a few fresh raspberries. To make 750ml of bacon whiskey, cook about 1/2 pound of bacon. Make sure to get some really nice bacon, don't go for the bargain stuff here. Once the bacon is thoroughly cooked, set it aside. You can eat it later. Collect the fat drippings and combine with 750ml of good quality whiskey. I used a blend of Jim Beam Rye and H's Eagle Rare Bourbon. Let the bacon fat infuse the whiskey for 48 hours. Then put the infusion in the freezer for 30 minutes to solidify the fat. Remove the bacon fat from the whiskey and filter well to remove any fat that remains. That's what I did, but I'm sure you can find other techniques with a little Googling. I was surprised how good this drink actually is. It's like a breakfast old-fashioned. The bacon and maple go really well together. The maple gives it a little sweetness, and the bacon provides a touch smoky funkiness. Everyone who tried this one really liked it, even if they thought they would hate it. 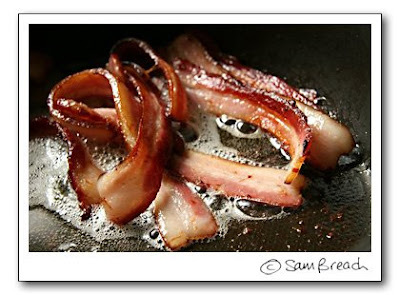 I want to thank Sam Breach from the wonderful Becks&Posh blog for the use of the excellent bacon photo above. I'd also like to ask you to please take my Reader Survey. It only takes a minute and will help me know a bit more about you and what you'd like to see in a cocktail blog. All survey responses are anonymous. I'll post some graphs with the results of the survey. If you've got a cocktail blog, and want to run a similar survey, contact me and I'll hook you up.